Avoid the base, 4-cylinder Highlander and opt for the V-6, as it’s more fuel efficient and offers much more power for not much more money. The 2019 Toyota Highlander is a family crossover SUV with three rows of seats and space for up to eight occupants. It has morphed from mid- to nearly full-size over the years and has become one of our favorite versatile family cars for its spacious interior, impressive safety record, and strong, reliable V-6 engine option. The Highlander received a visual refresh a few years ago, and the changes for 2019 are all cosmetic as well. The SE trim gets blacked-out headlights, taillights, wheels, and fog lamps, while other trim levels feature a new black plastic rocker panel on the sides and a few more chrome touches. The 2019 Highlander is available in LE, LE Plus, SE, XLE, Limited, and Platinum trim levels, many of which can be ordered with a hybrid powertrain. The 306-horsepower, V-6-powered Highlander Hybrid is one of the most fuel-efficient large crossovers, but the majority on dealer lots are powered by a 3.5-liter V-6 with 295 hp. The base powertrain is a 2.7-liter 4-cylinder with just 185 hp and comes only with front-wheel drive. The rest of the Highlander lineup can be had with all-wheel drive. For all but the lightest duty use, either of the V-6 Highlanders provides good acceleration. The Highlander has a soft, luxurious ride and it handles well for a vehicle that can seat up to eight in comfort.The Highlander’s blocky styling might suggest a more rugged side than competitors like the Mazda CX-9 and Honda Pilot, but the Highlander is still a car-based crossover meant to handle inclement weather, not off-road trails. For those looking to hit the unpaved path, Toyota offers the plenty-capable 4Runner. What the Highlander does better is haul passengers. Its front and middle rows are spacious and comfortable and even the third row has decent room for older children or smaller adults. A well thought-out interior with excellent small item storage adds to its appeal. 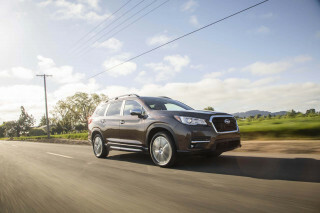 Toyota has also fitted the Highlander with standard active safety technology, including automatic emergency braking with pedestrian detection, adaptive cruise control, active lane control, and automatic high-beam headlights, and this family crossover also earns five stars in federal crash tests. 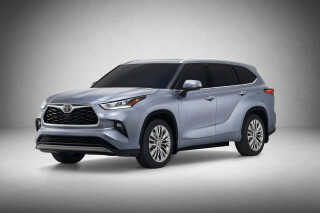 The Highlander’s myriad trim levels span a nearly $20,000 range from a $32,000 base Highlander to the plush, Lexus-like Highlander Limited at about $50,000 in Hybrid trim. 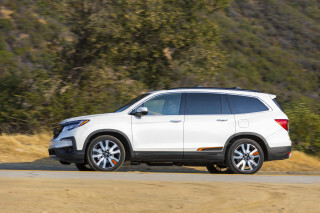 No Highlander is spartan, but they’re the among the only three-row crossovers on the market without Apple CarPlay or Android Auto functionality. A comfortable, useful interior is betrayed by a razor-sharp face on the 2019 Toyota Highlander. Toyota’s recent exterior designs seem to have taken a page from Lexus’s book with sharp angles, but the update hasn’t done this big SUV any favors. The grille resembles a razor, and the protruding snout seems overly angry, which is a shame because the rest of the Highlander’s styling is well-proportioned and muscular. On Highlander SE versions, Toyota adds a dark finish to the wheels, grille, headlights and taillights. It doesn't add any performance to go with the look, though. Inside, the Highlander is much more inviting than its razor-sharp face would suggest. A wide, logically-laid-out dashboard with plenty of storage space is a welcome sight, and the two-tiered look is both clean and functional, with pass-throughs for USB chargers to cut down on clutter. Each trim has a unique finish, though the faux wood on upper trims won’t really be fooling anyone. The 2019 Toyota Highlander is best had with the strong V-6 or thrifty hybrid and offers plenty of capability but no off-road chops. 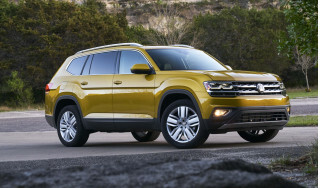 A 2.7-liter 4-cylinder is standard on the base LE trim level and with front-wheel drive and makes a paltry 185 hp and 184 pound-feet of torque, an inadequate amount for a 4,000-pound crossover. Fortunately, a 3.5-liter V-6 is optional, and much more popular for its strong combination of power and fuel economy. 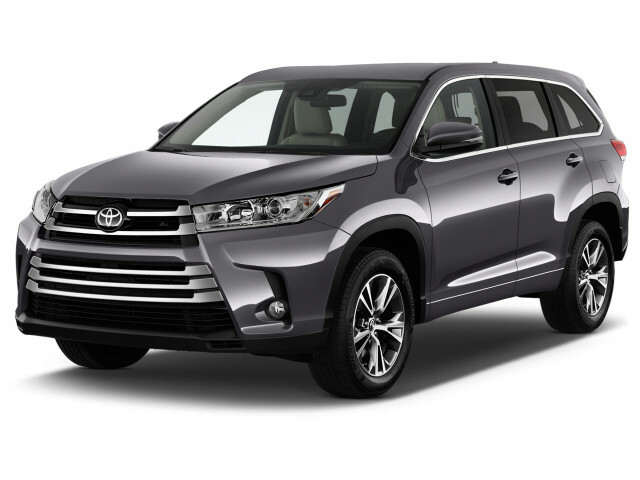 Making 295 hp and 263 lb-ft of torque and mated to a slick-shifting 8-speed automatic transmission, the V-6 Highlander is smooth, versatile and plenty powerful, not to mention available with optional all-wheel drive. 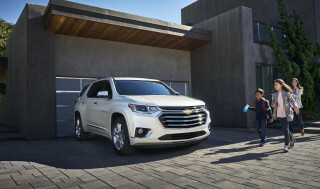 The Highlander Hybrid is available in LE, XLE, Limited, and Platinum trims, and uses a version of the V-6 engine mated to a battery and two electric motors that power the rear wheels, making every hybrid all-wheel drive. A combined power output of 306 hp suggests some pep, but this hybrid is best driven smoothly and frugally thanks to an increase of 300 pounds over the non-hybrid. The continuously variable transmission unfortunately introduces some engine droning into the cabin under hard acceleration. Every version of the Highlander is geared for comfort over canyon-carving, and LE and XLE models ride a bit better thanks to 18-inch wheels with plenty of sidewall to cushion sharp impacts. Stepping up to the Limited or Platinum trims brings 19-inch wheels that firm things up quite a bit. The Highlander SE trim includes a tightened suspension in the name of sportiness, but we think it just spoils the ride without any driving enjoyment benefit. All models have precise steering with a light feel. Respectable 8.0-inches of ground clearance makes some mild off-roading possible, but the Highlander is not equipped for anything beyond the occasional rough dirt road. The 2019 Toyota Highlander is as comfortable and storage-laden as crossover SUVs come, though not particularly luxurious. The 2019 Toyota Highlander’s best virtue is its comfortable and practical interior, laden with space for occupants and their gear. Front seat passengers are treated to soft, supportive thrones with standard power adjustability on the driver’s side for all trims. XLE and above trims add a power-adjustable passenger’s seat, though it isn’t height adjustable. Second row passengers have plenty of legroom and the ability to slide the seats forward and aft. Either a three-piece bench seat or two captain’s chairs are available, the latter of which drops capacity from eight to seven but increases access to the third-row seat. Behind the third row, the Highlander manages 14 cubic feet of cargo space, while that number balloons to 42 cubic feet with the third row folded flat. With both sets of rear seats down, utility nearly doubles to 83 cubic feet. The Highlander also deserves praise for its numerous cubbies and containers throughout the cabin, specifically the shelf integrated into the dashboard. Material quality is solid, though this SUV won’t fool anyone into thinking it came from a luxury brand, especially from the second and third row seats. LE models sport a painted silver trim that looks downmarket, but Limited and Platinum models swap in fake wood, and most Highlander trims are available with either synthetic or real leather. Thanks to standard active safety tech and great crash-test scores, the 2019 Toyota Highlander is one of the safest family crossover SUVs out there. The 2019 Toyota Highlander boasts an impressive safety record, both in terms of crash tests and standard active safety technology. All Highlanders come standard with a full suite of safety tech, including adaptive cruise control, forward-collision warnings with full-speed automatic emergency braking, lane-departure warnings, active lane control, and automatic high beam headlights, something competitors are only now starting to include as standard. The IIHS awarded the Highlander a Top Safety Pick+ award last year, and we expect the 2019 model to receive the top award as well, not to mention a 5-star overall rating from the NHTSA. However, the NHTSA tests found only 4-star performance in frontal crash and rollover, but that did not drop the overall rating. There’s a 2019 Toyota Highlander for just about everyone, from value-conscious base models to well-equipped near-luxury trims. The base Highlander LE comes in either 4- or 6-cylinder flavors but doesn’t look like a base model thanks to 18-inch alloy wheels, tinted windows, and turn signal mirrors. The interior gets cloth upholstery, a 4.2-inch LCD screen in the gauge cluster, a rearview camera, power driver’s seat, and a 6.1-inch touchscreen for infotainment with Bluetooth. The Highlander LE Plus trim adds about $2,400 to the price of the LE with the optional V-6, and includes an 8.0-inch touchscreen, smartphone-driven navigation, three-zone automatic climate control, a power passenger’s seat, synthetic leather and cloth upholstery, a flip-up rear window, and more for the price. The Highlander XLE adds a moonroof, full GPS navigation, real leather, heated seats up front, and a driver-controlled public address system that links to the speakers in the rear. Highlander SEs have a sportier appearance and suspension with blacked-out styling bits and black leather upholstery. 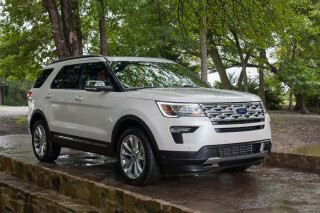 Stepping up to the Limited trim adds cooled front seats and heat for the second row and a JBL audio system among other perks, and the top-tier Platinum adds a surround view camera, heated steering wheel, and panoramic moonroof. The Hybrid range is mostly the same as the gas-only model, though is not available in LE or SE and comes only in all-wheel drive. The Highlander’s infotainment system is easy enough to use but can be slow to react to inputs, and unfortunately Apple CarPlay and Android Auto aren’t available. The 2019 Toyota Highlander is a fuel miser in hybrid form, but middle-of-the-pack otherwise. The most popular Highlander comes with the V-6 and all-wheel drive, and manages 20 mpg city, 26 highway, 22 combined, which are middle-of-the-road for family crossovers. Skipping all-wheel drive with the V-6 bumps those numbers to 21/27/23 mpg, but, opting for the base 4-cylinder carries no fuel economy benefit. The base Highlander manages a dismal 20/24/22 mpg. The Highlander Hybrid is the fuel economy star here, managing 30/28/29 mpg on the LE trim with 18-inch wheels, and 29/27/28 mpg for the XLE, Limited, and Platinum thanks to larger rims and a roof rack that increases drag. The Highlander Hybrid is only available with all-wheel drive.